For more than 35 years, the Bushido School of Karate has been committed to helping men and women of all ages (From kids to grandparents) discover the endless possibilities that come from the study of martial arts. Whether it’s self defense, self discipline, self confidence, focus, or just a highly-energized aerobic workout you’re looking for martial arts will deliver. We offer not only Bushido Karate Classes in Murfreesboro but also Jujitsu Adult Karate Classes and Cardio Kickboxing Classes. We pride ourselves on the successes of our students, instructors and the satisfaction of each person who trains or has a family member who trains with us here in Murfreesboro. At the Bill Taylor’s Bushido School of Karate we are a family. We want each person that comes through our door, to feel welcome and a part of something bigger. We believe in community involvement and outreach. 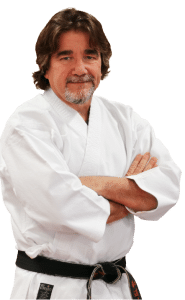 Sensei Taylor spends a lot of his time at schools around the community doing ‘bully buster’ classes, teaching self defense classes for women and supporting local charities. 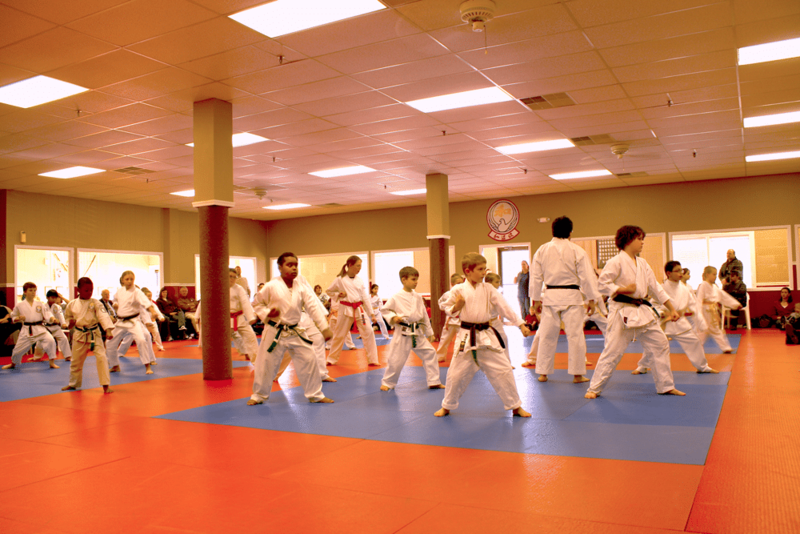 Our Karate Studio is special and we hope that you’ll come by and say hello and let us show you how Martial Arts can help you or your child achieve success. Bill Taylor began his study of the Wado Ryu style of Karate in 1973 under Newton Harris. The Bushido School of Karate was one of the few Karate schools in Tennessee and the first one in Murfreesboro. It was through luck that Mr. Taylor began a life long endeavor studying one of the most complete and thorough systems of Japanese Martial Arts. Following the departure of Mr. Harris, Mr. Bill Herzer took over as Sensei at the school and it was under Mr. Herzer’s direction that Mr. Taylor earned his Black Belt in 1978. Mr. Taylor was originally drawn to study Karate because of the individuality of it. Karateka (karate students) compete primarily with themselves as opposed to team sports. Mr. Taylor began competing in amateur point Karate tournaments, and became a very successful contender in the national scene, racking up wins at both The Battle of Nashville and the Battle of Atlanta. As a progression of that success, Mr. Taylor began pursuing a professional kickboxing career in 1980 and stopped competing in point tournaments. Because of an interest in competing in full contact Karate, Mr. Taylor began boxing with Sheriff Fate Thomas’ boxing team in 1979. Fellow team members included such notable pugilists as Jerome Coffee, Silver Medal Olympian Clint Jackson (also head coach), and future world champion Johnny Bumpas. Many punching techniques and defensive maneuvers taught at the Bushido School of Karate are a result in this training. Also, to aid in a professional kickboxing career, Mr. Taylor trained in Atlanta, Georgia under Asa Gordon, kickboxing trainer for world champions Bill Wallace and Jerry Rhome. At the Atlanta gym, Mr. Taylor trained with future world Champions Jerry Rhome, Jerry Trimble, and U. S. Champion Richard Jackson. Asa Gordon’s gym was sometimes visited by then up-and-coming cruiserweight, Evander Holyfield. In 1980, at eighteen years of age, Taylor competed in his first contact match in Atlanta, Georgia. Mr. Taylor won by second round knock-out. He went on to win two state titles and attain a number two world ranking in the bantam weight division. In 1988, Mr. Taylor traveled to Paris, France, where he represented the United States in his weight class for the Panama Jack International Kick Boxing Team. After this match, Mr. Taylor retired from competition to concentrate on running the Bushido School of Karate, which he took over as owner and chief instructor of Karate in 1981. Today Mr. Taylor is still actively involved in kickboxing. He has coached world class kickboxer Thomas Chesterfield, the current (1995) North American Welterweight Champion. As a Martial Artist, Mr. Taylor has trained under the most well-known instructors in the world. Bill Wallace, Joe Lewis, and Don Wilson are some of the notable instructors with whom Mr. Taylor has worked. One of the highlights of Mr. Taylor’s Martial Arts career came in September of 1975 when, as a Go-Kyu, he was able to work out under the direct supervision of the Wado Ryu founder and Grandmaster, Hironori Otsuka I.
Mr. Taylor has also worked out under the present Wado Ryu Grandmaster Hironori Otsuka II on four occasions. One of these instances was an intense one-on-one session Mr. Taylor received from the Master at Meiji University in Tokyo, Japan, in December of 1994. Mr. Taylor has also studied under Tatsuo Suzuki (8th Degree Black Belt), and on several occasions with Masafumi Shiomitsu (8th Degree Black Belt), both of whom learned their art from the founder. Mr. Taylor now concentrates his efforts on running one of the oldest and largest schools in Tennessee. He has also served as the accredited Karate Instructor for Middle Tennessee State University since 1984. Mr. Taylor received his Roku-Dan (6th degree Black Belt) from Mr. Bill Herzer in 1995, and his Sichi-Dan (7th degree Black Belt) in 2003. Mr. Taylor also trained under the-late Cecil T. Patterson, who, until his death in 2002, was the highest ranking occidental in the Wado Ryu system and head of the United States Eastern Wado Ryu Karate-Do Federation. Mr. Taylor serves on the board of Directors for the U.S.E.W.K.F., which is now under the direction of Mr. Patterson’s eldest son, John, (Sichi-Dan). This organization evaluates and grades all Wado Ryu Black Belt candidates from the Eastern United States.